One of the major benefits of the event mapping solution approach is that when you need to create a public facing web map for spectators or clients you can do it at the push of a button. 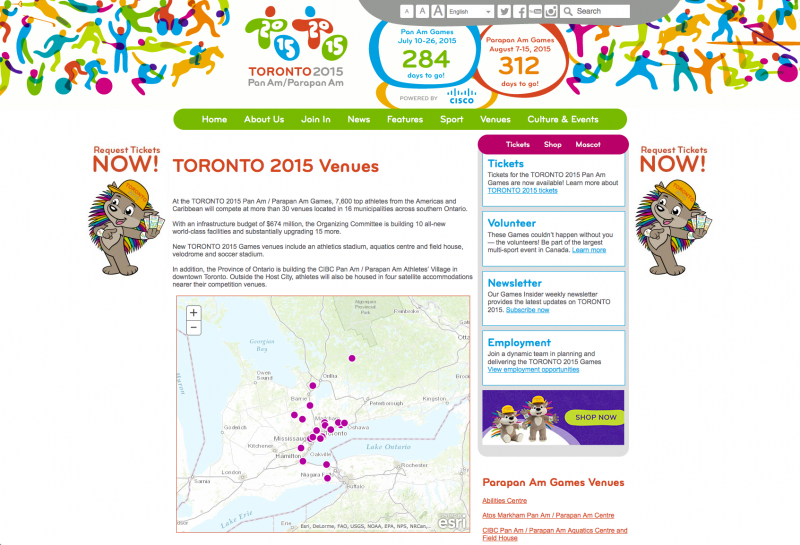 For Toronto 2015 Pan Am Games we have just implemented a map for the website using the core functionality of the event mapping solution. This live map shows venues and gives users a visual sign of where things are. The beauty of using a GIS solution for this is that when things change (as they do quite often in the events industry) we can just update the data and the public facing maps all change. With over 100 million hits having a responsive, cloud based system to show your custom map is essential so we are always very pleased when our clients see the savings this approach can give. Update Dec2015: Since the event has now closed this map is no longer active, however we can give examples of this functionality on our demo system if you want to see how it works.